" Yeah, I know how to ride a bike. If I understand what’s on your mind, Simon, well: it’s tough, but possible. We’re not cyclists, but I think we can do it". Simon goes back to his descent. He has a strange twinkle in his eye when he starts talking again. "That’s right Vitto, I was thinking of linking up the North faces by bike. We could actually make it…" he suggests "And we could even add a third peak. I was thinking of your home mountain, Grossglockner. It will take some time, the road is a lot longer, and the ascent to Grossglockner is not short. But I think that it is possible in two days"
It takes eight months to prepare for such a feat. You have to train your legs and breath to deal with the bike. But above all you have to train your mind: endure forty-eight hours without sleeping is doable; it wears you out, but it is far from being impossible. To be awake and mentally alert for two days in a row doing such intense activities, well, that’s a different story, that is the limit that needs to be pursued. It’s snowing hard on Ortles, so hard that it makes you lose your way. Simon and Vitto are there, somewhere, under the first wall of ice which shuts off the long couloir. Their head lamps can no longer be seen, and even their GPS tracking seems uncertain on their whereabouts. A few hours to go until midnight, they have just set off but things are already looking difficult. They are still full of energy of course, but that blizzard is scary, the kind that forces you to turn your back and head home as soon as you can. Simon and Vitto confabulate, squashed against the wall to stop their words from being blown away. The decision has been made: half an hour. Give it a go for half an hour, and if things don’t work out, go away, quickly, because a good alpinist is the one who grows old, especially if he has children to look after. It doesn’t stop snowing. But the blizzard appeases enough to decide and understand where you are situated and where you want to go. Simon and Vitto continue the ascent, quickly and precisely up the ice wall. Midnight has just struck when they reach the peak. The descent is almost like a dream: first of all on their skis, through this incredible powder, fresh, light snow which at the end of May very few people have had the privilege of touching. Then on foot, cutting through the thundering silence of the woods, bend after bend. Then it is time to pick up their bike, because there is no time to waste. The sunset’s terse pink colour greets them at Castelbello in val Venosta; before eight o’clock they have already reached Bolzano: enough time to gulp down a croissant and a couple of coffees and off they go, back on their saddles, towards val Pusteria. The road is uphill now and the sun is strong: not a very relaxing cycle, that’s for sure. When they reach Dobbiaco the sky is covered in clouds once again, giving Simone and Vitto a break from the heat. A drop, then another, and the heavens open. This happens often during summer in the Dolomites; a powerful downpour, the kind that drenches you, those that are so strong that it’s is as if the water is slapping you. The two buddies, stoic, continue to cycle, even if fatigue is setting in. Reaching Misurina is no stroll in the park, but the true challenge is about to come, at the start of the road which climbs up to Tre Cime. It is almost five kilometres, 473 metres of vertical height gain, with an average gradient of 10%: a short ascent, unforgiving, which just on its own is tiring enough, let alone with hundreds of kilometres in their legs, and the Ortles climb. 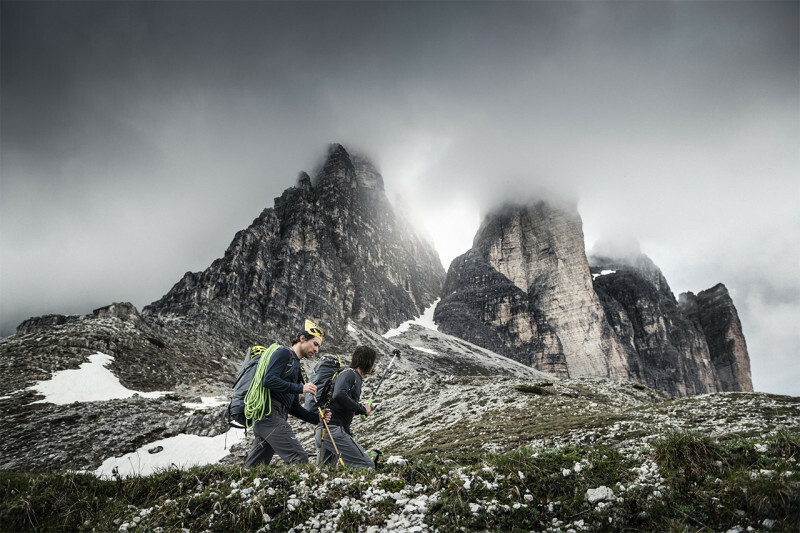 The Tre Cime are not mountains. Their elegant, solitary and soaring shape above all is a symbol, and just touching its rock is an emotion. Simon and Vitto leave their bikes, staggering towards the start of the Comici-Dimai on Cima Grande. Everything is going well, if it weren’t for the fact that it has started raining again. The route is completely drenched. Not drops, but proper little rivulets which freezing cold, slip into the two climbers’ sleeves. It is a crazy situation, but it takes at least three pitches before someone utters a word. It is Vitto: "Do you really want to climb up here Simon?" The rain answers his question, and increases its intensity. Simon and Vitto look at each other. Bailing is never easy, especially after so much effort, after months of training, and not for what others may think. Giving up is difficult because it says something about yourself, and it may also not be what you want to hear. But the good alpinist is the one that grows old, and with a few steep abseils the two reach the ground. And while they carve through the scree with a heart heavier than their legs, heading south, the mountain offers a solution: it is the route Spigolo Giallo, another one of Emilio Comici’s routes on Cima Piccola. It is popping out of a thick and frayed cloud, and the conditions seem better. It takes them an instant to tie up and set off. Reaching the peak, instead, requires its toll in terms of time and fatigue. It happens at 9 pm, 26 hours from the start: 1991’s “record” for now has not been broken. But life is still long enough to give it another go. Simon and Vitto descend slowly, abseiling first of all, then down the scree. At the base their bicycles are waiting for them. Yes, because now it is time to set off: off quickly, with the wind almost cutting their faces. Crossing the border as if in a dream, on their own, accompanied simply by the noise of their pedals and their breathing. 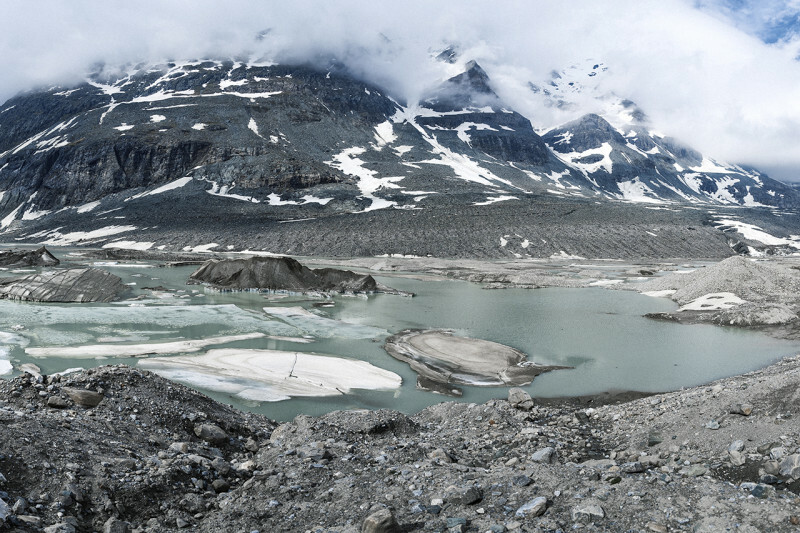 Along the 117 kilometres which separate them from Grossglockner Simon shuts one eye, every now and then: like cetaceans who sleep only with half a brain at a time. The ascent is vague and celestial, just like a dream. The moraines and the small melt water lakes run by as if seen from a train. By now “fatigue” is only a name for something which you will deal with in another moment, after the end. Simone and Vitto are two dark figures in a sea of glacier white, while they leave their tracks in the powder snow with slow and deep steps, towards Mayerlrampe. Reaching the peak is almost apnoea, is yet another effort with someone who made that effort with you, who shared the happy weight of exhausting exertion. Yes, because that is what life is all about, and so is the human mind: the satisfaction lasts only if it is difficult to conquer. Simon and Vitto do not chat while they go down towards their finish line, after almost forty five hours of activity. The time will come to talk, to discuss their feelings, maybe even to plan something new. Now there is only room for awareness: alpinism is around the corner, just there, where the noise of people ends. All you have to do is remember this, and sometimes to make a step forward you need to take one backwards. So, it was not North3, but who cares, it was beautiful, and that is what counts. They have arrived. Simon jumps, kicks his heels, starts laughing and hugs Vittorio. It is raining again, but it doesn’t matter. There is some bubbly, and families, and friends. "Vitto!" Simon asks curiously and full of expectations "listen, can you ride a bike?" Vittorio stops. The question is strange, it is not inappropriate, but nonetheless bizarre. Anyone knows how to ride a bike, well, practically anyone, but if the answer was so predictable Simon wouldn’t have asked it. The two know each other well, Vitto knows that Simon has been planning for some time to do something exceptional, testing the limits of fatigue: it only takes a moment before, with the day’s last rays of sunlight, Vittorio’s lightbulb comes on. Of course: Hans Kammerlander and Hans-Peter Eisendle, 1991, the link up of Ortles and the Grande of Lavaredo by fair means, making their transfer on bike. 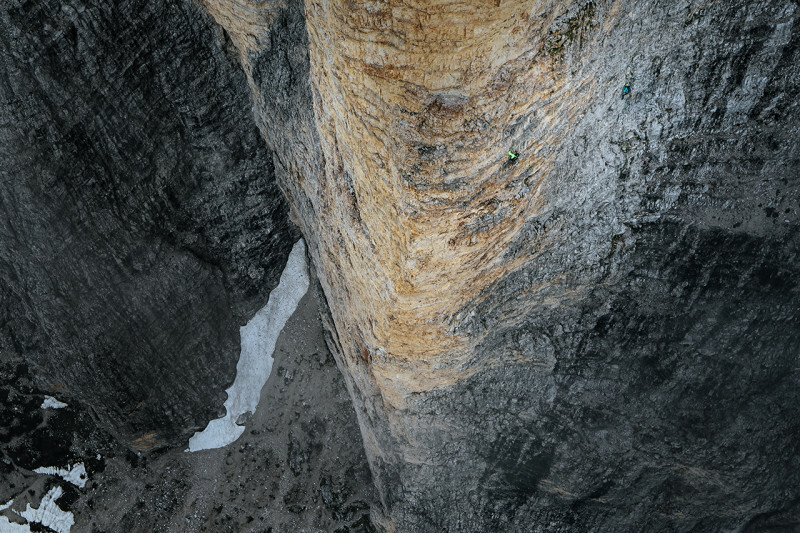 Of course: it took them twenty-four hours and 246 kilometres to climb two of the most beautiful North faces in the Alps. 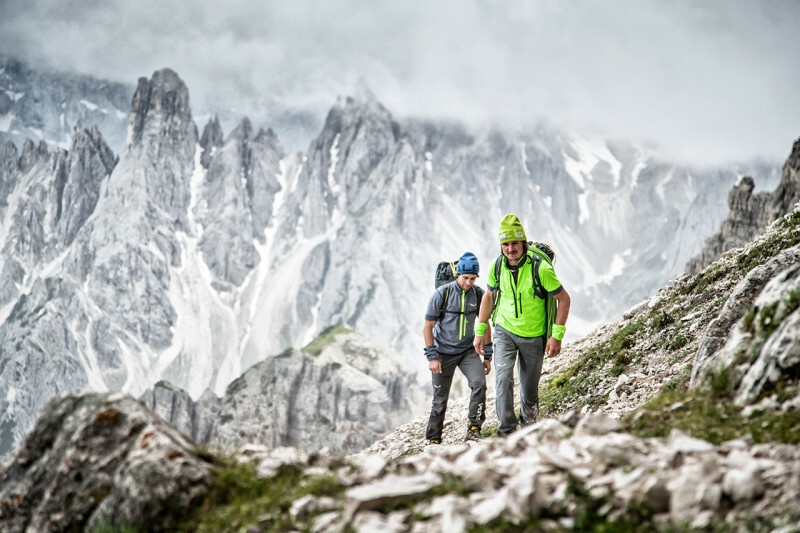 In those days the feat had left its mark: in fact, it had been interpreted as a new way of considering alpinism, in a progressive and sustainable manner. "Yeah, I know how to ride a bike. If I understand what’s on your mind, Simon, well: it’s tough, but possible. We’re not cyclists, but I think we can do it". Simon goes back to his descent. He has a strange twinkle in his eye when he starts talking again. "That’s right Vitto, I was thinking of linking up the North faces by bike. We could actually make it…" he suggests "And we could even add a third peak. I was thinking of your home mountain, Grossglockner. It will take some time, the road is a lot longer, and the ascent to Grossglockner is not short. But I think that it is possible in two days." It’s snowing hard on Ortles, so hard that it makes you lose your way. Simon and Vitto are there, somewhere, under the first wall of ice which shuts off the long couloir. 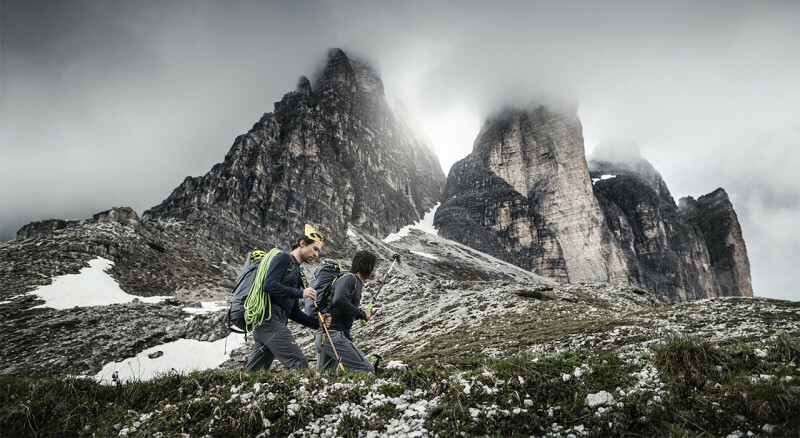 Their head lamps can no longer be seen, and even their GPS tracking seems uncertain on their whereabouts. A few hours to go until midnight, they have just set off but things are already looking difficult. They are still full of energy of course, but that blizzard is scary, the kind that forces you to turn your back and head home as soon as you can. Simon and Vitto confabulate, squashed against the wall to stop their words from being blown away. The decision has been made: half an hour. Give it a go for half an hour, and if things don’t work out, go away, quickly, because a good alpinist is the one who grows old, especially if he has children to look after. It doesn’t stop snowing. But the blizzard appeases enough to decide and understand where you are situated and where you want to go. Simon and Vitto continue the ascent, quickly and precisely up the ice wall. Midnight has just struck when they reach the peak. The descent is almost like a dream: first of all on their skis, through this incredible powder, fresh, light snow which at the end of May very few people have had the privilege of touching. Then on foot, cutting through the thundering silence of the woods, bend after bend. Then it is time to pick up their bike, because there is no time to waste. Reaching the peak is almost apnoea, is yet another effort with someone who made that effort with you, who shared the happy weight of exhausting exertion. Yes, because that is what life is all about, and so is the human mind: the satisfaction lasts only if it is difficult to conquer. Simon and Vitto do not chat while they go down towards their finish line, after almost forty five hours of activity. The time will come to talk, to discuss their feelings, maybe even to plan something new. 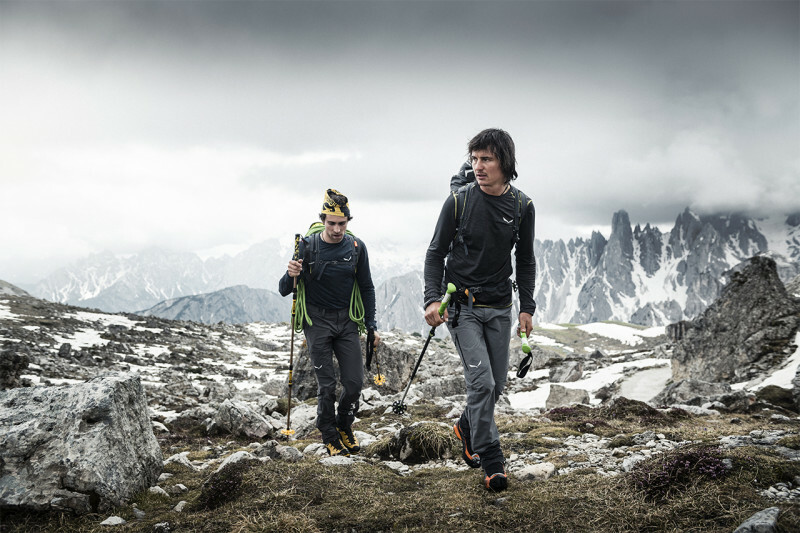 Now there is only room for awareness: alpinism is around the corner, just there, where the noise of people ends. All you have to do is remember this, and sometimes to make a step forward you need to take one backwards. So, it was not North3, but who cares, it was beautiful, and that is what counts.